Following his debut, Slumber Tides (Miasmah) and sophomore effort, Until The Point Of Hushed Support (Sonic Pieces), Haines has joined the ranks of Australian imprint Preservation with his latest offering, and if previous efforts often denoted a taste for sombre moods, Digressions appears more open and accessible. It is also Haines’s most ambitious work yet. Conceived from recordings Haines made during a series of workshops with the Theale Green Community School Chamber Orchestra whilst he was composer in residence at the Theale School of Performing Arts in Reading, Digressions also features regular Berlin-based friends Peter Broderick and Dustin O’Halloran. Right from the first moments of opening piece Ernetti, Haines’s use of sweeping orchestral components gives this album a very different dimension to previous recordings, but it is really with Caden Cotard that he unleashes the full potential of the orchestra. He does so in typical restraint and control however, carefully retaining beautifully set introspective moments amidst more developed orchestral parts. It is a perspective which he repeats over and over through the whole album, and which only shows the maturity with which he approaches he work as a composer. The music is always incredibly well balanced and nuanced, at time drawing on strong emotional ties, at others relying on much more subtle and delicate touches. 183 Times remains in reflective mood throughout for instance as Haines hangs sparse piano notes over a stark backdrop, whilst a solitary violin carves delicate motifs at the fore. Azure is also reflective for much of its course, but Haines makes use of the orchestra’s range by layering shimmering marimba textures, upon which he then adds equally as sparkling piano touches. The piece builds incredibly slowly, as Haines brings in additional sections of the orchestra and adds discreet electronic loops in the second half. These remains clearly audible for a while but eventually get swallowed by the swelling string work toward the end. On closing piece Nuestro Pueblo, Haines finally finds an opportunity to step out as a pianist and become the focal point, at least for a moment, but, as once again orchestral sections are brought in, he takes once again a back step. 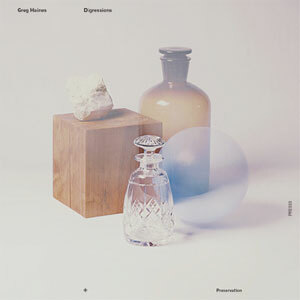 Digressions is undoubtedly Greg Haines’s most accomplished record to date. Whilst he has worked with small formations in the past, there is here a much greater emphasis on the collective aspect of the music, making the whole record more consistent. Equally, Haines has created some of his most cinematic pieces here, making this an extremely convincing piece of work.